An Indonesian Lion Air Boeing airliner carrying 189 people and flown by Indian pilot Bhavye Suneja crashed into the Java Sea on Monday minutes after taking off from here, with no sign of survivors.The Boeing 737, JT 610, disappeared from the radar 13 minutes after take off from Jakarta to Pangkal Pinang on the Indonesian island of Bangka, according to Basarnas, Indonesia's National Search and Rescue Agency.Flight data showed it made a sudden, sharp dive into the sea 12.96 km north off the coast of Tanjung Bungin in Karawang, West Java, the Jakarta Post reported.No survivors were found, said Bambang Suryo Aji, Director of Operations at search and rescue agency. "We need to find the main wreckage. My projection is there is no survivor. Because the condition of the bodies of the victims already found were not intact any more. "And this has been several hours after the incident. It is very likely that all the 189 people have been dead," he told a press conference. 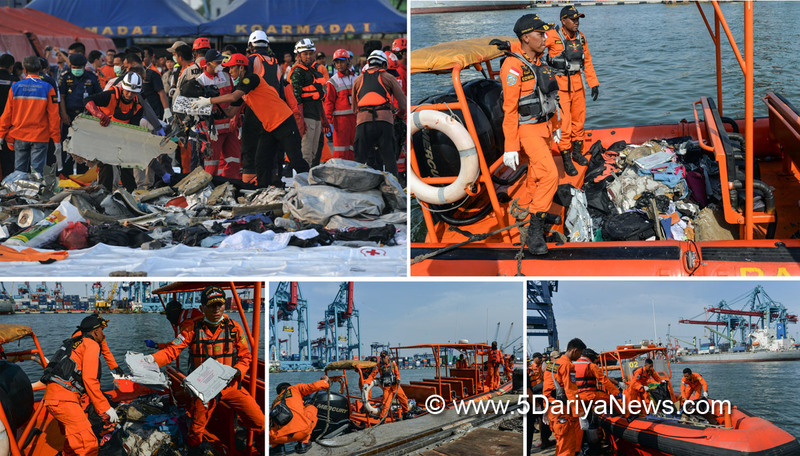 Rescue workers retrieved six bodies from the sea where the crash took place. Search teams were working against high waves and strong currents and underwater robots were being used in the search effort. Authorities said they were still trying to locate the black boxes and emergency locator transmitter, which was currently not transmitting.The aircraft, manufactured this year, was commanded by Captain Suneja, with co-pilot Harvino, according to a spokesman of the airline. Authorities said before the crash, the pilot had made a request to return to base. "There were two foreign nationals (aboard the flight), one Indian citizen and one Italian citizen," Lion Air Group Managing Director Daniel Putut said in Jakarta. Suneja was the captain while the Italian was among the passengers. "Our deepest condolences on the tragic loss of lives in the Lion Air Plane crash, off the coast of Jakarta today. Most unfortunate that Indian Pilot Bhavye Suneja who was flying JT610 also lost his life," Indian Embassy in Indonesia said in a tweet. Suneja was from New Delhi and was living in Jakarta with his wife. According to Suneja's LinkedIn profile, he received his pilot's licence from the US-based Bel Air International in 2009. Suneja had clocked more than 6,000 flight hours while his co-pilot had more than 5,000 flight hours to his credit. The Indian was associated with Lion Air as an airline pilot since March 2011.Of the 189 on board, two were pilots and six were flight attendants.The search and rescue agency operations director said rescue workers had found debris appearing to be the plane's tail. The main wreckage was still not been located.Rescuers released footage of debris and personal items floating in the water at the crash site, including handbags, clothing, mobile phones, ID cards and driving licences. Plane seats were also sighted among the debris.Dozens of divers and the military were working to retrieve the bodies.Lion Air chief executive Edward Sirait said the plane reported a technical problem during its previous flight from Denpasar to Jakarta on Sunday night, but that was resolved before it took off on Monday morning.On a request by the pilot to return to base shortly after take off, Sirait said Lion Air was still trying to verify the information. Sirait said the plane was "airworthy" and that the pilot had carried out all preflight inspections. He added that the pilots had passed mandatory drug screening.According to Jakarta-based Elshinta radio, a tugboat notified the Tanjung Priok Port that it spotted a plane crashing into the water on Monday morning.The airline spokesman said the Boeing 737 MAX plane was manufactured this year and had been operated by Lion Air since August 15.